BariatricPal is an authorized distributor of GENEPRO 2nd Generation, also known as GENEPRO GEN2. 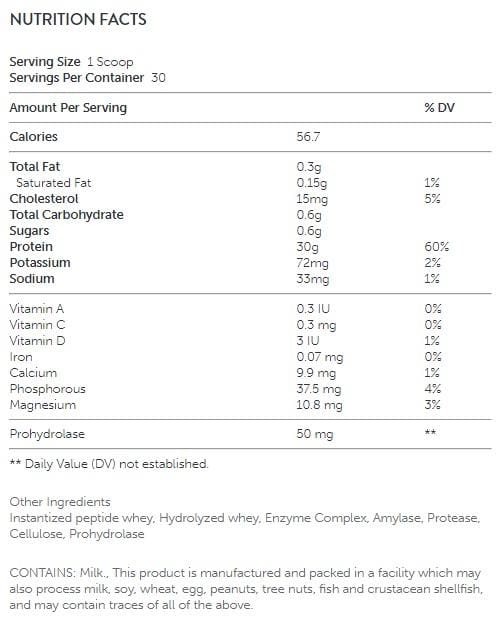 GEN2 has the equivalent of 30g Protein per 1 Tbsp Serving. It has the addition of ProHydrolase (protease enzyme blend) which increases absorption from 94% to 97.8% and contains 56.7 calories per serving, while GEN1 has 98 calories per serving. Don't be fooled by companies selling the older version at lower prices! 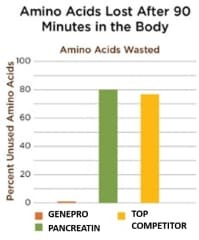 The best just got better with the introduction of Generation 2 GENEPRO! We here at BariatricPal are always striving to bring to market the very best and most cutting-edge products that have ever been seen in medical and performance nutrition. With that being said, we are constantly testing and evaluating supplements and trying to improve upon them to insure that we provide the very best to you. This is the case with GENEPRO GEN2. Medical Grade protein perfect for bariatric, post-surgical patients or anyone looking to add pure protein to their diet. The combination of the Tri-Protein and the way it is processed along with the addition of protease enzymes allows for the equivalent of a 30gram serving of protein with only a 1 TBSP serving size. 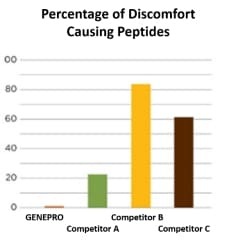 GENEPRO hasn't broken the laws of physics with getting a 15g weight to equal 30g in weight but with the absorbability/bioavailability value of Genepro Gen2 you are getting the equivalent of the same 30g serving size of regular whey protein. With the small granule nature of this protein, it allows the powder to mix almost instantly in any beverage (hot or cold). It is flavorless and odorless and does not change the consistency of the beverage. Coffee, juice, soda or any item you may be drinking, can now be your source of the most complex and complete protein. This electrophoresis process allows us to remove bacteria and impurities in the base protein for immediate absorption into the system and bypasses the intestinal digestive system by 94%. 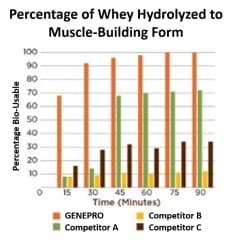 With GENEPRO GEN2, MuscleGen has added in Prohydrolase® which further increases the absorbency to 97.8%. Compare this to Whey Isolate that has an absorption rate of only 31%, making GENEPRO GEN2 three times more effective than any other protein on the market. GENEPRO is ideal for individuals with gluten sensitivity, lactose intolerance, diabetics and bariatric patients. Because of this immediate absorption your body peaks with a surge of insulin 10 times more anabolic than Testosterone. This will also trigger your thyroid from a molecular level to match the surge of insulin causing your body to be in a full anabolic and fat burning state while supplying the muscles with the world's most complete and usable protein. This combination feeds the muscles and aids in the repair and the building of new muscle at a record rate. The evolution of performance supplementation is here and it goes by the name of GENEPRO GEN2. This item is also available in single serving trial packets here. 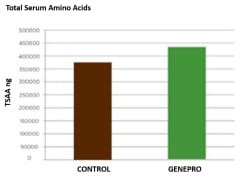 PDCAA (protein digestibility corrected amino acid) is Greater than 1 (>1). Each container of GENEPRO GEN2 includes a 1 TBSP scooper. Use your GENEPRO GEN2 wherever you go and in whatever you already consume! This unique protein and its super absorbency also eliminates the common problem with most all other protein supplements on the market. GASTRIC DISTRESS. The process and the addition of Prohydrolase® makes GENEPRO GEN2 almost completely digested without ANY gastric distress. No bloat, no gas, not excessive waste! Undigested whey protein will simply be excreted from the body, resulting in wasted amino acids. This is not the case with GENEPRO GEN2. MuscleGen starts off with the best natural instantized and hydrolyzed whey protein from grass fed cows located here in the United States. They take the raw powder through our electrophoresis process and then through a centrifuge drying process. To stabilize the protein at the molecular level and to combat the acidic taste that occurs during this process, they attach a strand of six amino acids called a hexapeptide. The end result is an odorless, flavorless protein that is ultra-convenient to use in any food or beverage that you normally consume. This pure powder with the addition of Prohydrolase® allows for a 97.8% absorption rate that occurs in the upper gastrointestinal tract. This eliminates gastric distress and allows nearly all of the protein to be consumed. What everyone is saying about GENEPRO Medical Grade Unflavored 30g Protein Powder - 2nd Generation!